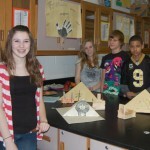 Manor Middle School teachers, Mr. Reustle, a seventh grade history teacher, and Mrs. Foulk, a seventh grade science teacher, teamed up to help students better understand ancient Egypt with some hands-on learning. While studying the Egyptian Civilization unit, students discussed the concept of mummy preservation and why the Egyptians practiced it. 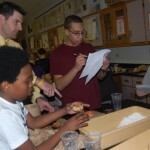 The students were able to perform a hands-on experiment using the same principles as the early Egyptians. 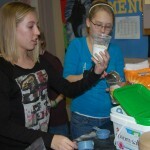 They used apples and different solutions such as baking soda and epsom salt to see the effects on the fruit. 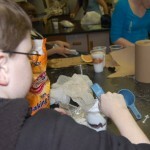 The idea was to extract the moisture content from the fruit to preserve it. 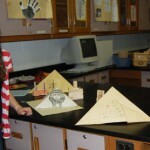 After the experiment the students created a sarcophagus and pyramid, similar to what the Egyptians would do.